One of the best Track Frames in the World, The 2016 Koga Kimera. The Kimera project started as a personal promise by Koga's Managing Director, Mr. Wouter Jager, to Theo Bos, Olympic silver medallist at the Games of 2004: to supply him with a personal track frame which would answer his demands, since no frame in existence could. The basic need was to make an extremely stiff frame, able to prevent his massive energy from vanishing into useless flex, against as little increase in weight and drag as possible. This challenge resulted in 'the Kimera project', Koga 's challenge to develop the worlds fastest track frame for the fastest man on the track. A great opportunity for Koga to once again push the existing boundaries and a new chapter in Koga's long history in innovation based on top sporting demands since 1974. In a 2 year process, starting in early 2005, the frame was developed by a conglomerate of mainly Dutch companies under the supervision of Koga BV. The cooperating parties were: TNO (a famous research institute), NLR (Dutch aerospace wind tunnels), DSM (chemicals), Shimano Benelux (components) and BioRacer (clothing). The Kimera was designed employing state of the art aerodynamics, biomechanics and carbon technology. The frame design was optimised even before building the first prototype using digital simulation techniques such as Finite Element Models (FEM). The special Ulthymo carbon fibres, 2.5 times stronger then conventional fibres, were laid by hand. Frame geometry and aerodynamics were repeatedly tested and optimised in wind tunnel tests. Over the course of the project Theo Bos contributed regularly as advisor and test rider. Over time this evolved into a project to supply the entire Dutch national track team, which included many Olympic medal candidates. Koga-Miyata knows: quality has a price. The project went through several phases, from extensive designing, prototyping $and test riding to the roll-out of the first version in November 2006. By then the total was close to the equivalent of half a million. Since the bike's introduction at the end of 2006, this figure has increased to a current total equivalent to not far off one million US dollars. This extremely rare figure for the bicycle world must however be put in context: it represents the sum of all of the work on both frame and components (wheels, handlebar, clothing) in hours and materials. The process included massive R&D, designing, extensive wind tunnel and track tests, external consultants, prototyping, frame moulding, and, finally, the construction of a small batch. The final outcomes made this project worthwhile in many respects, however. Technically, the results were staggering, as the frameset proved to be 130% stiffer than Theo's existing frameset (already recognized as a top frameset), so nearly 2.5 times stiffer, with hardly any increase in weight, and with a substantial decrease in drag for the frame without rider (-10%). All off these values were measured independently. Both Koga and Theo Bos conclude: mission accomplished! With no less than a true technology boost, a new chapter has been added to Koga's long history in innovation based on top sports demands. In the near future, these insights will contribute to the high end Koga-Miyata bike collection, ranging from road racing bikes via MTBs to travel bikes and (electric) hybrids. As a proof of this, Koga were delighted to receive the Good Industrial Design accolade for the Kimera from a Dutch professional jury in 2008. Since its introduction, the black bikes with the lion's head and dragon's tail (from the Greek mythical creature, the Chimera) have attracted massive attention from other teams and the public. In spring 2008, the runner-up Dutch team won 3 World Championship titles with the Kimera in Manchester. A final and still lighter batch of Kimera bikes were handed over to the Dutch track team management in Spring 2008, bringing the total close to 40 bikes. 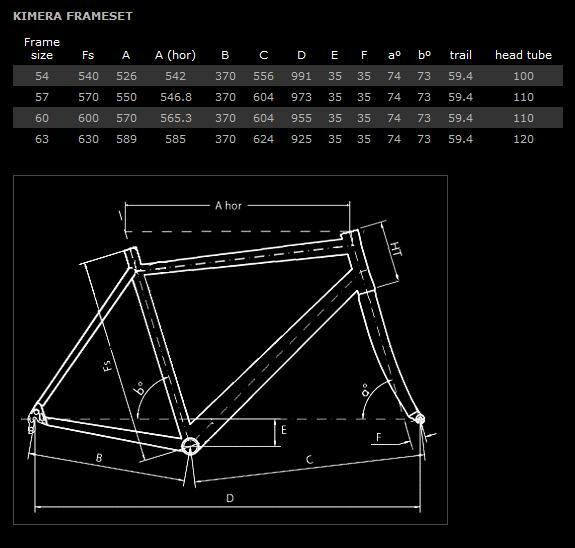 Frame description - Ultra stiff FEM optimized carbon frame. Built with Highmodulus carbon fiber and finished with a durable 1k PicoWeaveTech carbonfiber mesh. Equipped with integrated headset.